RIVERSIDE, Calif., April 9 2008 -- Fleetwood Enterprises' RV Group today announced that its Discovery Class A diesel motor home, one of the best-selling diesel motor home brands on the market, will be featured on Season 5 of John Ratzenberger's Made in America. The season premiere aired at 9:00 p.m. on Wednesday, April 2, 2008, on the Travel Channel. "We are excited about the opportunity to once again feature our diesel motor homes on John Ratzenberger's Made in America," said Paul Eskritt, president of Fleetwood's RV Group. "The show is an ideal place for us to showcase the functionality and style of our most popular diesel motor home brand, Discovery, as well as highlight the many benefits of the RV lifestyle in America." Fleetwood worked with Creative Differences Productions Inc., the series' production company, to provide two motor homes to serve as recreational and rest space for show host, John Ratzenberger, and the film crew. The Discovery 39S (triple-slide floor plan) and Discovery 39V (full-wall slide floor plan) include standard DuPont(R) full-body paint, Samsung(R) Home Theater surround sound system, and 84" interior ceiling height, making extensive travel time more enjoyable and comfortable. "We always enjoy working with Fleetwood during the production of John Ratzenberger's Made in America," said Shayne Lewin, the show's supervising producer. "The Discovery served as a wonderful home away from home during the taping of the show. Fleetwood is a quality American company that develops some of the best recreational vehicles available today -- a perfect fit for a show that celebrates Americans and American manufacturing." For more information about Discovery and all of Fleetwood's recreational vehicles, please visit http://www.fleetwoodrv.com. John Ratzenberger's Made in America focuses on stories of the best people, places and products in the United States. The program (airing at 9:00 p.m. every Wednesday on the Travel Channel) spotlights distinctively American companies, products and man-made wonders and the unique niche each has found in pop culture. The show has featured such flagship American companies as Harley Davidson, Crayola and Campbell's Soup. Now in its fifth season, John Ratzenberger's Made in America visits Viking Ranges, Sears Tower, Rock & Roll Hall of Fame, Maytag Dishwashers, and The Space Needle. Fleetwood RV is the recreational vehicle operations group within Fleetwood Enterprises, Inc. FLE, a leading producer of recreational vehicles and manufactured housing through its subsidiaries. Fleetwood's recreational vehicle line includes motor homes, travel trailers, fifth wheels and folding trailers. 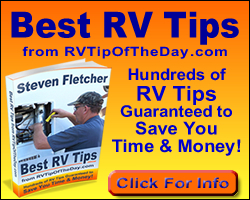 Fleetwood RV products are distributed through a nationwide network of approximately 1,000 dealers. For more information on Fleetwood Enterprises, visit our website at http://www.fleetwood.com.